Leading Manufacturer of felt drum beaters from Jaipur. By focusing on variegated demands of our respected clients spread all over the country, we are offering Felt Drum Beaters. With the assistance of skilled and dedicated staff professionals, the offered range is made by using best quality raw material and modern methodology. This range is available in plethora of colors and sizes for full the need of customers. Our range is checked on quality parameters for assuring the quality before the dispatch. To meet the variegated specifications of our esteemed patrons, we are engaged in offering Felt Drum Beaters. Well known for the quality & flawless performance in the market, offered products are made by using quality material as per the set standard of market. Our customers can avail these products from us in varied sizes at most affordable price. 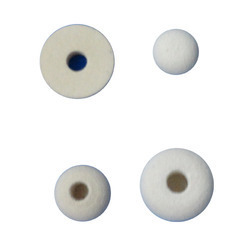 Looking for Felt Drum Beaters ?